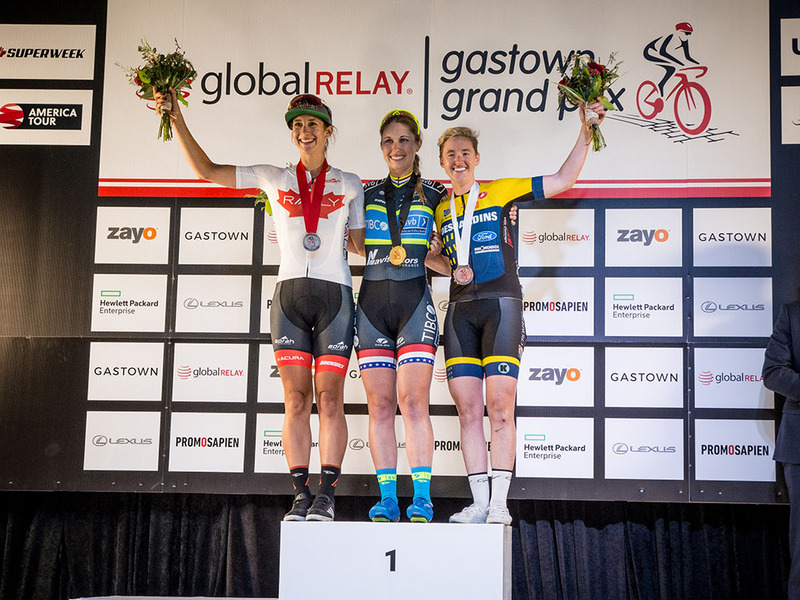 Prior to the 2018 Global Relay Gastown Grand Prix, the list of men's cyclists who had won the famed race three times in a row stood at just one - Canadian cycling legend Ron Hayman. 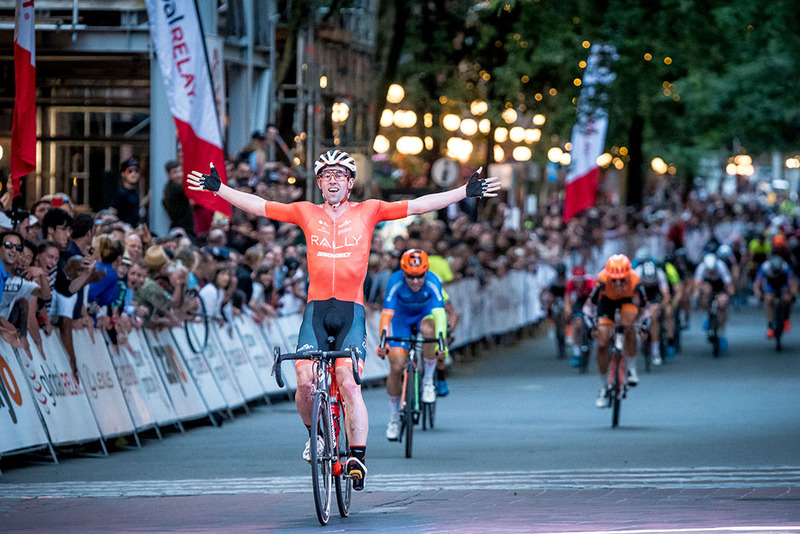 But after attacking on the final lap along with his Rally Cycling teammates Brad Huff and North Vancouver's Ryan Anderson, Eric Young sprinted to win the race and add his name to the record books. "I've won the race three years in a row, but Brad Huff has won that second corner three years in a row. He knows exactly how to put the guy on his wheel in winning position. He's done so many of these crits and he's such a great guy, I totally owe him this, it wouldn't have happened without him," the Boulder, Colorado native said. During the 50-lap, 65 kilometre race, it didn't look like the 29-year-old Young would get the chance to make history as Hermann Radteam cyclist Christopher Hatz chased a prime and then continued to build a gap between himself and the field. His lead maintained right until there were just a few laps to go, but as the peloton inched closer, even Hatz didn't think he could hang on to win. "I didn't think so. Normally, we had a different tactic with my teammate Florenz Knauer, just grabbing some primes and doing a lead out for him in the final, but after the first prime, I just stayed off," Hatz explained. "I did quite good with a gap between me and the bunch, then I found a rhythm and it worked quite well, but the last ten laps were so hard. It was so long, and time didn't go by and it was just pain. But the crowd was great, I had some goosebumps, so I didn't feel my legs too much." Young, who has been on the podium at all five races of this year's BC Superweek series, including three wins, was very cognizant of Hatz's move up the road, to the point where he even wondered if the bunch would catch him. "I have to take my hat off to him, that was an amazing ride - it took, honestly, three or four teams to get him, he totally deserves all the primes that he got." Knauer came second on Wednesday night and even though Hatz is his teammate and German countryman, the attack took him a bit by surprise too. "I have no idea where it came from, I knew he was strong, but he went all out from the start and wow - that was an incredible ride," said Knauer, who has been on the podium for four out of the last five BC Superweek raced. "I hoped he would stay away for the entire race, I think he definitely earned the cheers and the primes, he's a beast." On the last lap, Knauer was ready for Young, Huff and Anderson to try and team up to take over the race. "I was first on Eric's wheel and then Brad took out and I got a little gap between us, so I couldn't really sprint against them," he said. "I'm a little sad about it, but that's bike riding and he deserved it, he was strong." Silber Pro Cycling was able to break through to get a spot on the podium for the first time at BC Superweek this year as Emile Jean of Trois Riveres, Quebec came third behind Young and Knauer. "We've been pretty close all week, but to finally crack the podium here in Gastown with this huge crowd is obviously a very special feeling, so I think Silber's pretty happy with this podium here," said Jean. He normally provides the final lead out for teammate Pier-Andre Cote who is currently out with an injury. "Pier and I have been pretty much interchangeable all season, so to have my chance here with Ryan Roth here is obviously a big help. I'm happy to take the pressure and take the opportunities I'm given to get something for the team." 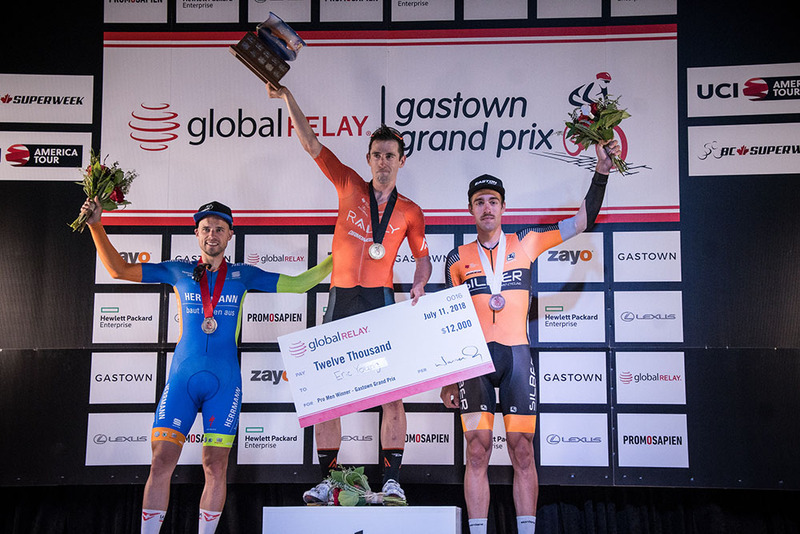 With such an historic and exciting finish to the 2018 Global Relay Gastown Grand Prix, next year is set to be just as special as Eric Young goes for a record-breaking fourth straight victory and the $12,000 prize purse that goes with it. Team TIBCO-Silicon Valley Bank rider Kendall Ryan joined a very select club of cyclists on Wednesday night as a two-time winner of the Global Relay Gastown Grand Prix. 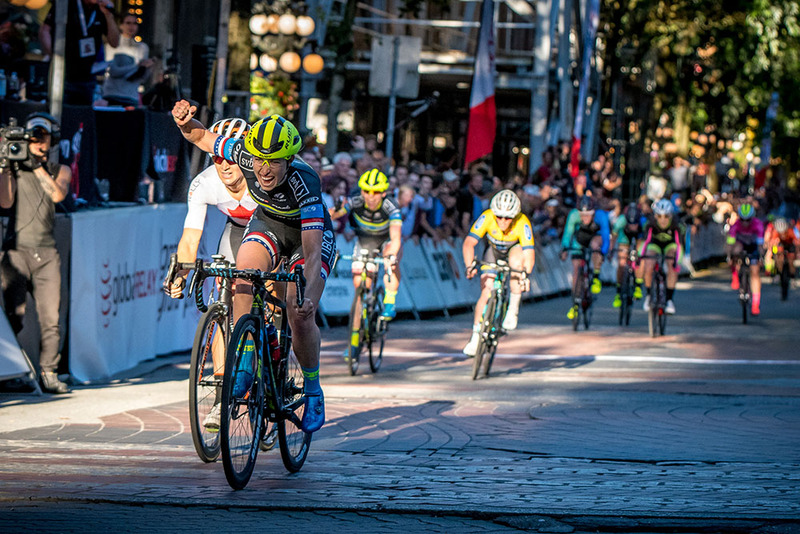 Only three women's riders – and six overall - have won two in a row in Gastown, and Ryan is now one victory back of Verna Buhler's historic three straight wins. The accomplishment means tons to Ryan, who began racing bikes at age six after being born into a family of cyclists, but so does the $12,000 in prize money that makes the Global Relay Gastown Grand Prix North America's richest criterium race. Ryan is on fire at BC Superweek this year, as she's won four of the first five races in the series, picking up more than $16,000 in prize money alone – nevermind any primes she's claimed. It – along with the fact that she was the defending champion - caused the 25-year-old from Ventura, California and her TIBCO teammates to have massive targets on their backs. "They were attacking the crap out of us today. We only had four girls as well, two went home and one went off to Europe, so it's really hard when you've lost some teammates. I had to do my fair share of the work as well, so that just made the race that much harder... and a lot sweeter," added Ryan. In second was the 2018 Canadian Criterium National Champion Sara Bergen of Vancouver, who now has two straight podium appearances after missing the beginning of BC Superweek due to illness. She won the New West Grand Prix on Tuesday and is now 2-for-2 while wearing the maple leaf as national champion. Third place went to Marie-Soleil Blais from Desjardins-Ford p/b Cromwell. She definitely noticed that Wednesday's race was one of attrition. "It was one of the hardest races, every team was very aggressive, but I think it was good for me. It helped me keep my position at the front and just follow things," said the St-Rosaire, Quebec native, who made her first appearance on the podium at BC Superweek in her career. "It's great, this is my fourth or fifth time here, I've never cracked the top ten. I raced really well, it went well and I'm really happy." 8 Devaney Collier (Can) Cyclery Racing all s.t. 25 Frederique Larose Gingras (Can) TaG Cycling Race Team all s.t. 28 Emma Lujan (Can) Glotman Simpson Cycling both s.t. 96 Luke Mudgway (NZL) H&R Block Pro Cycling Team all s.t.